Action Packed Paintball is Minnesota’s exclusive outdoor low impact paintball field. We put a spin on the traditional paintball action! We specialize in paintball for both kids and adults using low impact paintball! The modern game of paintball has evolved into one of the funnest activities for all ages in Minnesota. Until recently, paintball has most commonly been associated with being painful and leaving unwanted bruises. Worry no more! Now kids and adults can now enjoy paintball with less pain! Low impact paintballs are (.50 inches in diameter) smaller, lighter and more fragile than the traditional (.68 caliber) paintball. 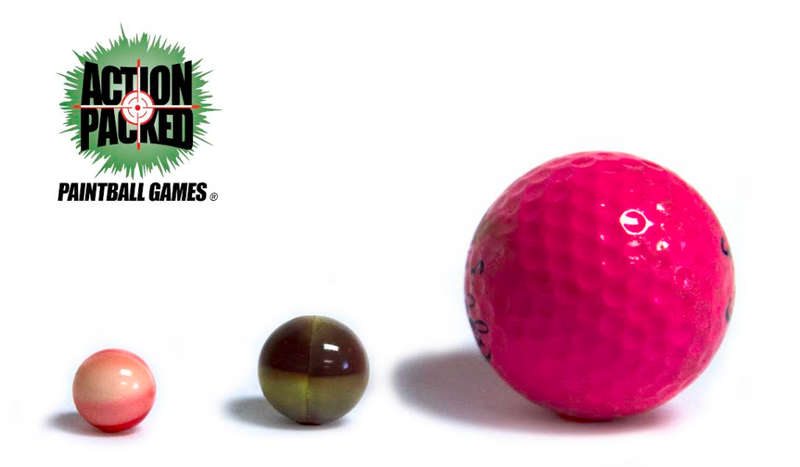 These specific paintballs deliver less sting upon impact making the experience more fun! A .68 caliber paintball weighs 3.00 grams. A .50 caliber paintball weighs only 1.25 grams (approximately the weight of a paperclip). Using the weight and average paintball velocity of the two paintballs we can calculate the amount of force a low impact paintball has when shot. The low impact format takes a majority of the pain out of paintball impact by reducing the weight, size and structure of the paintball. In fact, the the weight is cut by 60% and by .18 inches in size. By reducing the overall mass of the paintball the player feels a lot less of a sting compared to the standard (classic) paintball. How much less of an impact will you feel? Good question; that why we dug a bit deeper. The weight of the paintball is not the only factor that determines the amount of sting felt. The speed or velocity of the paintball is another important factor. Our paintball guns at Action packed Paintball shoot a smaller paintball. In fact, the paintballs we use at our paintball park is 1/3 the weight which means the .50 caliber paintball guns provide roughly less than 1/3 the sting. 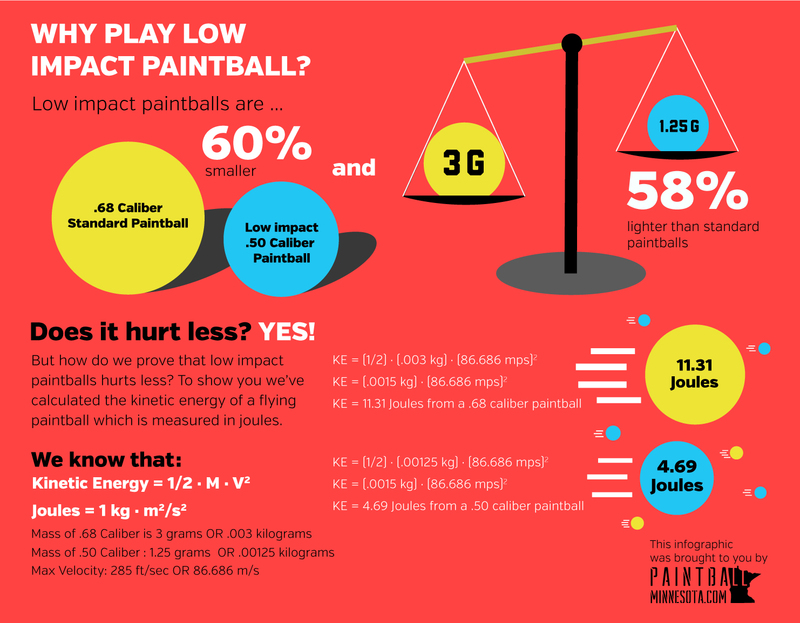 In actual lab testing, it was shown that low impact paintballs only transfer 5 joules of energy versus 13+ joules of energy for the standard size paintball.